Its one thing saying I would repurchase something after I've used it up, but its another actually doing it. Im a beauty product junkie with enough face cream to last me until I'm at least 50 odd. 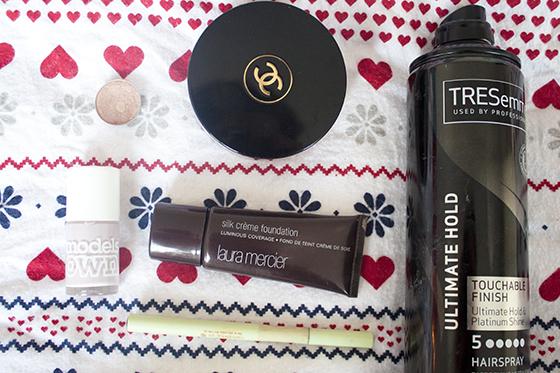 However there are some products that I adore, and always go back to and repurchase. Today I'm going to be sharing a few of them! I have a fair few products but I'm going to split them up so they aren't too long or boring! Pixi Lash Line Ink (£12): I was given this originally as a PR sample however I became hooked after a few uses and I've actually repurchased it twice now. It's a super easy to apply felt pen liner, it has a very slimline flexi nib which means it's perfect for creating flicks of varying widths. It's highly pigmented, long lasting and sort of waterproof. It doesn't start to migrate at the first sign of water, but it's not totally fading! Perfect for winter months as my eyes water like crazy! Laura Mercier Silk Creme (£32): I was always under the impression this foundation just wasn't for me. It never really worked for me up until Kate made me repurchase it and now I cant imagine using a different foundation. Build-able, luminous and lightweight coverage, this little baby is applies like a dream. I'm really glad I took the risk and repurchased it because I adore it. It's funny how you think you hate something to then flash forward a few years and your opinion of something completely changes. I've actually went and bought two shade of this for when Im tanned and when Im not! MAC All That Glitters (£11): I've repurchased this shadow a few times over the years as it's just one of those basic eyeshadows that I can just go to with minimal effort. It's a beautiful warm, peachy color that brings out the green tones in my eyes. It's really flattering and easy to wear and I would totally recommend this shadow if your a MAC cosmetics virgin. It's gone up in price so much over the years but its always something I'll go back to without hesitation! Tresemme Ultimate Hold Hair Spray (£4.69): To be honest I'm totally indifferent when it comes to hairspray, I just tend to always buy the huuuuge cans of Tresemme Ultimate Hold Hair Spray for ease! I've repurchased them for years now and an ex boyfriend of mine once said that I smell like a mixture of "Tresemme and dolly mix"
Chanel Bronze Universal (£31):I still cant bring myself to call this Soliel Tan de Chanel. This is a warm toned orangey bronzer that suits me all year round, including me at my palest in winter or bronzed in the summer. It gives a natural glow without being shimmery which is perfect for day time or night. I use it most of the time to correct my foundation if it's a bit on the pale side. I recently started using this again after tossing it aside, I always forget ow much I love it!